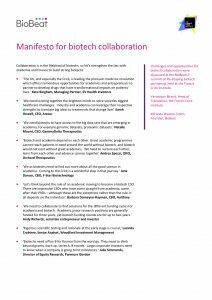 This Manifesto for biotech collaboration calls for strengthening the ties of biotech with academia and finance to build strong biotechs. Leaders set out key actions for success. The Manifesto arose from discussions at the BioBeat17 summit at the Francis Crick Institute.